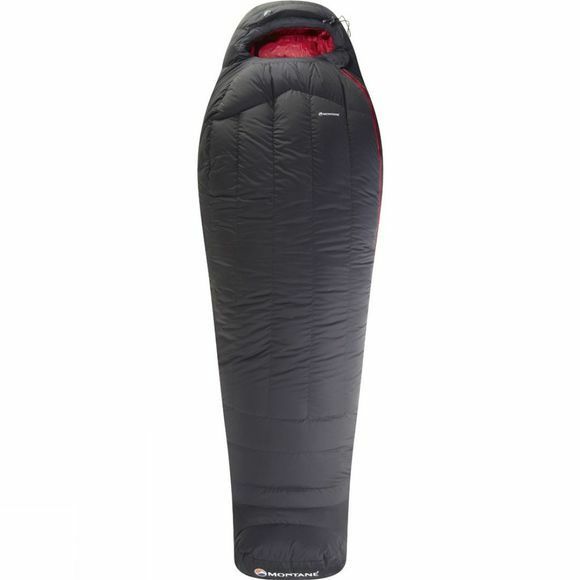 The Deep Heat Sleeping Bag is a specialist sleeping bag and almost certainly a leader in its class. It is a piece of sleeping equipment designed for some of the harshest mountain environments in the world, from the European Alps in winter to the greater ranges. Highly tailored with an engineered, ergonomic form and foot box, it guarantees the user to sleep in absolute comfort, even in the most extreme conditions. The upper part of the bag is a design evolution taken from the most technical of Montane clothing garments, allowing the hood to securely fit and move with the head whilst sleeping and offering sheltered protection whilst sitting upright either in a tent or on a bivouac. An outer shell of Pertex Endurance provides an elevated level of weather resistance. Trapezoidal baffle construction reduces cold spots and a well-considered down layout maximises heat retention even whilst sleeping on the side.